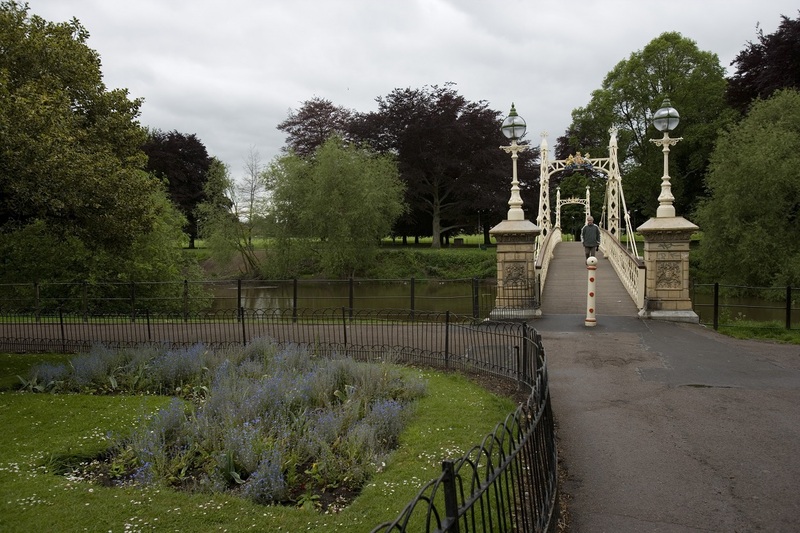 The modern city of Hereford, on the boarder between England and Wales, is a treasure trove of historic buildings and artefacts. 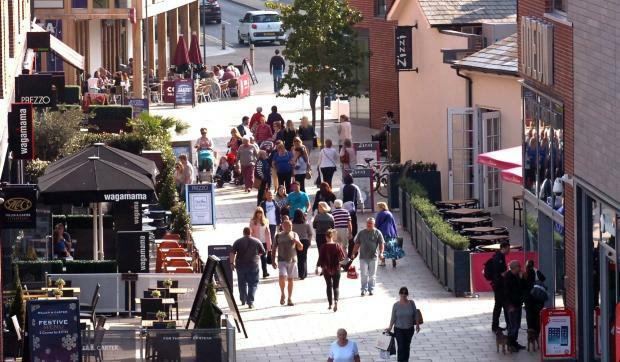 While the Old Market is an up-to-the-minute, and buzzing, shopping destination. 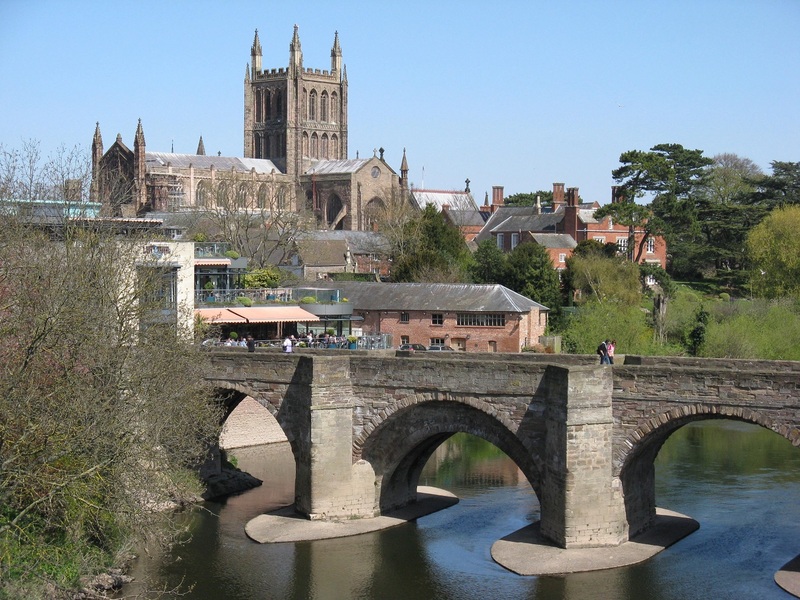 The see of Hereford dates from AD 676, and the present Cathedral from C11th-C12th. The columns and arches in the nave and choir are all of this period. The magnificent tower has 218 steps. Should anyone need a rest on the way up, there’s a place to stop and look down on the mosaic tiled floor of the south transept. The Cathedral holds the Mappa Mundi which Richard of Holdingham, prebendary of Lincoln and Hereford Cathedrals, drew on vellum. It depicts a map of the world as understood in 1290. The document appears in the UNESCO’s Memory of the World register. The Cathedral also has one of the four surviving copies of the 1217 version of the Magna Carta. And, if all of that isn’t enough reason to drop by and take a look, the Cathedral houses the largest Chained Library in the world c. 1444. In the first public libraries books were chained to the shelves to prevent people taking them away. The bookcases, desks and seats date from 1611 while some ancient books here are C9th-C15th including the Anglo-Saxon Gospels from 800AD. Other early treasures include The Golden Legend, or The Lives of the Saints, and Confessio Amantis by John Gower, both printed by Caxton in 1483. 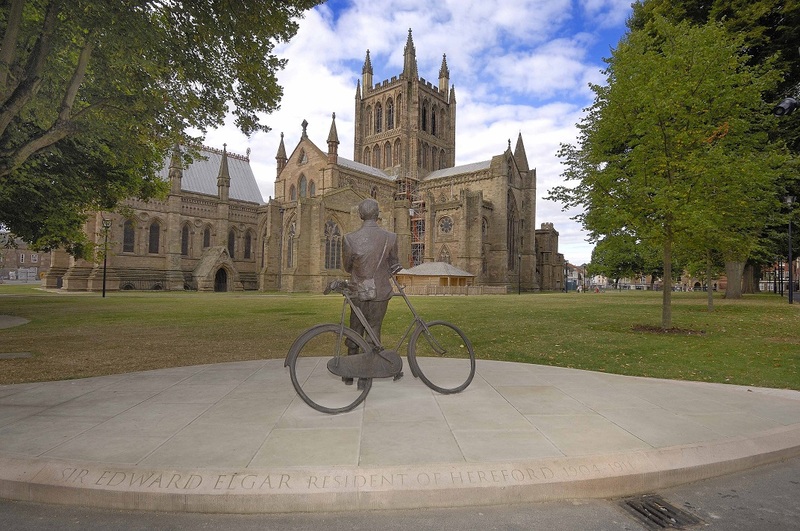 Jemma Pearson sculpted a statue of Sir Edward Elgar with his bicycle which has pride of place by the Cathedral. The statue honours Sir Edward Elgar’s many musical achievements and his connection with the area. The nearby Grade II* Listed Episcopal Palace and buildings date from the C12th-C17th with some C18th and C19th alterations. The works include the chapel of 1798 and the stable block of 1841 by Phillip Hardwick. The Palace gatehouse has C17th timber-framing over its arches. There was an C11th castle on this site. It last saw action during the English Civil War when Parliamentarians captured it. Later the castle was taken down and all that remains is Castle Cliffe, a private residence. Redcliffe Gardens occupies the site of the castle keep. On the Green there is a monument to Admiral Lord Nelson, Freeman of the City. There are some surviving timber-framed buildings in the town notably the Old House in High Town, Aubrey’s Almshouses on Berrington Street, the Black Lion on Bridge Street. Aubrey’s Almshouses date from around 1630. They are timber-framed standing on a brick plinth. Church Street has some timber framed buildings, substantial Georgian terrace, and a view of the Cathedral. Additionally there are some timber-framed buildings behind the brick frontages. The street links the commercial areas of the City with the Cathedral. Also, Bridge Street has a number of Georgian frontages. St Owen Street has some Georgian architecture and leads to St Peter’s Church. The Shirehall is on the north side and the distinctive Edwardian terracotta town hall on the south side. Hereford Waterworks Museum occupies the Victorian pumping station which dates from 1865. It is a Listed building and a Scheduled Monument. Today the museum hosts the largest collection of working pumping engines on one site in Britain. The engines range from an overshot water wheel to the most modern electric submersible pumps. The grounds and buildings are also interesting and the Visitor Centre has a welcoming cafe. The whole museum is accessible for visitors with disabilities. The Black and White House Museum is a C17th timber-framed building in the heart of Hereford’s commercial centre. The building dates from 1621, and has been home to the museum since 1929. Jacobean daily life is at the heart of the displays. Who could resist seeing the Jacobean baby-walker! In addition, the collection of English oak furniture is internationally important.